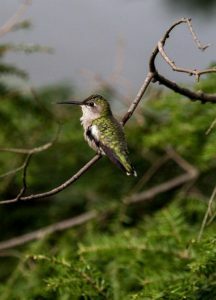 Audrey Murphy of Auburn captured this photo of a ruby-throated hummingbird in Auburn on a windy day in May. I am submitting a photo of a hummingbird that was taken in Auburn on a windy day in May. This is a picture of a female Ruby-Throated Hummingbird with her tongue sticking out.